The Divine Comedy by Dante and Me, the Mob and the Music by Tommy James. 96 Euston Road, London [home of the British Library]. Two movies that arm-wrestle for that title used to be seen as wildly fantastic satires, but now might as well be historical documentaries. How many moments in life bring to mind this exchange from Network [the 1976 film written by Paddy Chayefsky]? Walter Amundsen: And you would describe Mr Jensen’s position on Beale as inflexible? Frank Hackett: Intractable and adamantine. My current favourite film is Liberation Day, a documentary about art, assumptions and the visit of the Slovenian group Laibach to North Korea. Running Scared, the unproduced masterpiece of my friend Alan Bleasdale. That would be terribly bad manners, but I have walked out of a couple of operas. While I can’t recall titles, I can whistle an aria or two. Very hard to say because it changes by the hour or by the day, but there is hardly a moment that is not improved by Fletcher Henderson’s Queer Notions. There are countless couplets to admire, but they could only have been imagined by their authors, so envy is futile. Lines I love are: “I believe in love, Alfie/ Without true love we just exist, Alfie/ Until you find the love you miss you’re nothing, Alfie,” from Alfie by Burt Bacharach and Hal David. And: “Dressed in stolen clothes she stands, cast iron and frail/ With her impossibly gentle hands and blood-red fingernails,” from Shades of Scarlett Conquering by Joni Mitchell. “Time flies like an arrow. Fruit flies like a banana.” Not strictly speaking a poem, but the words of that great Marxist, Groucho. It was either this or Teeth by Spike Milligan. It never fails to lift my spirits while removing plaque. Without question, the trumpet. I am a third-generation musician and the previous two were trumpet players. Nothing will ever erase the shame of my failure to work on my embouchure. And Your Bird Can Sing by the Beatles and Let’s Put Out the Lights (and Go to Sleep) by Rudy Vallée. If I could own one painting, it would be . 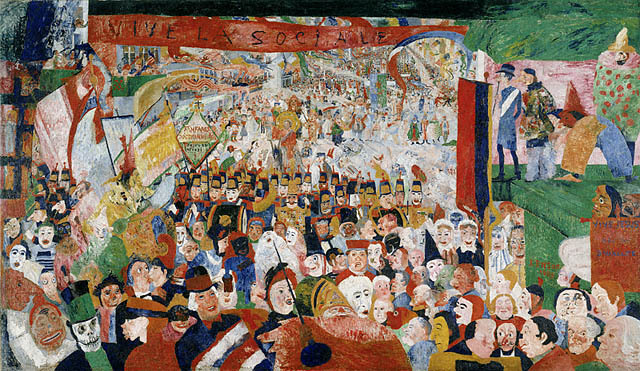 . .
Christ’s Entry into Brussels in 1889 by James Ensor. I’d need a great big wall. The happy tears flowed when I first heard Love Is Here to Stay, the wonderful new record by my wife, Diana [Krall], with Tony Bennett. It is everything that’s both modern and timeless about Gershwin songs, performed by the two best interpretative singers of their generation, taking such joy in each other’s company. The sorrowful tears? Listening to all of Amazing Grace on the morning that Aretha Franklin departed. Switching between a fascinating BBC Four documentary about the secret life of spoons and late night reruns of Gogglebox. In the words of the Allen Toussaint song, “Back in baby’s arms”. I’m having a fantasy dinner party, I’ll invite these artists and authors . . .
OK, so it’s a fantastic version of Come Dine With Me with Marcel Duchamp and Jacques Prévert. They could make “exquisite corpse” drawings on the napkins, but to keep it interesting I’d also invite Albrecht Dürer, because he could render a very fine hare or a supernatural rhinoceros, while Joseph Cornell could box up the leftovers. And I’ll put on this music . . .
A Foggy Day sung by Dirk Bogarde on Lyric for Lovers, when it was time for them to leave. I am awaiting She Remembers Everything by Rosanne Cash and season two of The Deuce on HBO. I wasted an evening watching/listening to . . . Nothing is ever wasted, least of all me. I don’t consider myself worthy to rate that which is “overrated”. There isn’t enough ink to print the names of all the overlooked songs, but you’ll have to find the book for yourself. Now read on . . . The next stop (June 4th 2002) was Minneapolis, my favourite city between the coasts. . We had enough time to make two visits to the Minneapolis Institute of Arts, one of my favourite museums in the U.S.
99 1/2 x 169 1/2 in.